Detex Corporation, an industry leader in life safety and security hardware for commercial properties, introduces the next generation of multi-point locking security door hardware. Built for maximum strength, the ECL-230X Exit Control Lock features heavy-duty, three-bolt construction that provides a uniquely high level of toughness against attempted intrusion. It stands up to assault by the bad guys and reduces employee and customer theft. The ECL-230X-TDB is a heavy-duty, easy to install three-bolt multipoint lock whose construction takes panic hardware to a whole new level of toughness and eases your back door security worries. Ideal for back doors requiring both panic hardware and high-level protection from break-ins, it is designed with a larger deadbolt that goes deeper into the frame than other locks in the category. The 230X has been engineered and constructed with top quality components to ensure reliable performance and to give businesses the best possible protection against back door break-ins. Connecting rods are solid steel, rather than the less reliable hollow rod/cable construction. Life safety and code compliant, the Detex ECL-230X-TDB serves as both panic hardware and a maximum-strength locking device. The ECL-230X-TDB includes a photo-luminescent sign, 100 decibel alarm and 3 locking points per door. Together, the 3 bolts have been tested to withstand 10,000 lbs. of pull force. Add suffix DX3 (ECL-230X-TDB-DX3) for a total of 6 locking points to almost any out-swinging door application for even stronger security, providing an additional line of defense against break-ins. 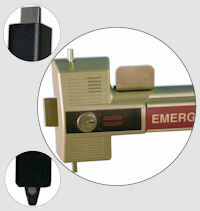 Even if the exterior door hinges are compromised the DX bolts keep the door locked and secure. These passive deadbolts are easy to install and offer another layer of attack resistance. 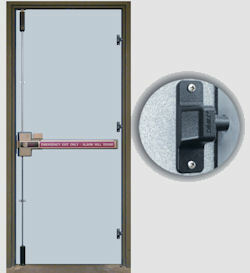 Through-bolt mounting installation improves the door’s holding strength. You choose the right application and level of protection by choosing 1, 2 or 3 bolts. The 230X has many accessories available. From its headquarters in New Braunfels, Texas, Detex designs, manufactures, markets and ships products around the world. Detex is known internationally for life safety and security door hardware, loss prevention and architectural hardware, integrated door security systems, and guard tour verification. Visit Detex’s website at www.detex.com or call us at (800) 729-3839.